Sammy Hagar’s latest release is the twenty-fifth studio release in his illustrious career. It also marks his sixteenth release under the Sammy Hagar moniker. Many artists over the past several years have released cover albums and such. 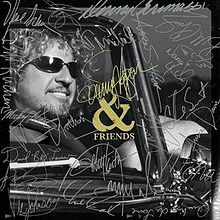 This one is a little different as it features three Hagar compositions as well as some of Sammy’s favorite songs. It is also loaded from top to bottom that reads like a list of who’s who in the world of music. Performances by stars such as Kid Rock, Neal Schon, Nancy Wilson, Toby Keith along with Sammy’s usual players Chickenfoot cohorts (Joe Satriani, Chad Smith and Michael Anthony) and his solo band, The Waboritas (Vic Johnson, Mona Gnader and David Lauser) to name a few. Of the Hagar penned tunes the blues flavored “Winding Down” kicks off the affair. Heart’s Nancy Wilson joins up with Hagar on the tropical flavored “All We Need Is An Island.” The third Hagar original “Father Sun” features his son Aaron on background vocals. Some of the standout covers include “Ramblin’ Gamblin’ Man” which was recorded true to the original and the down-tempo “Margaritaville” which was played as a duet with country superstar Toby Keith. At this point in his career Sammy Hagar has little to prove anymore to anyone. That he can still put out a quality album with quality vocals is proof enough. The album is a strong representation of Hagar’s entire career and the one thing that stands out is the variety of music contained within. This album has a little something for everyone. If you were stranded on a desert island and didn’t have Hagar’s greatest hits, this album would do in a pinch.